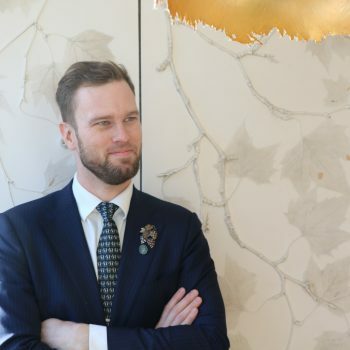 Larsson took over the coveted task of managing the gargantuan list at wine Mecca Hide late last year, after the departure of the restaurant’s director of wine, Piotr Pietras MS. In the restaurant’s two sections, Above and Ground, there is a mind-boggling 6,500 bin wine list, with Larsson in charge of service and selection at Hide’s more formal Above restaurant, and his fellow head sommelier Dmytro Goncharuk in charge of the less formal Ground restaurant. The mammoth wine list takes in not only the enormous number of bottles stored in the restaurant’s cellars, but also the stock at nearby Hedonism, where anything can be rustled up for high-spending guests. Larsson, from Sweden, began his career in wine after receiving a sommelier-education course for his 18th birthday. A stint at Château Cantenac-Brown in Bordeaux soon followed, where he was able to gain a first-hand insight into the process of winemaking, before setting off for Australia. There he worked for a couple of wineries in Hunter Valley, before taking on a sommelier role at Luke Mangan’s Glass Brasserie restaurant in Sydney. Since then, Larsson has gone on to work at several Michelin-starred restaurants in Stockholm and London, including the two-Michelin-starred Oaxen Krog in Sweden, where he was head sommelier. Keen to deepen his knowledge further, he is currently studying for his Master Sommelier title. I got bitten by the ‘wine bug’ after a visit to a winery in Navarra with my father, who works as a wine and spirit importer in Sweden. When my interest in wine started to form I had no plans to go into the sommelier profession. One of the moments that sparked my desire to become a sommelier was when I watch the Swedish sommelier championship in 2008. I was struck by how much knowledge they had about wine and their charisma. Since then I have kept on finding new role models/inspirations in the industry to keep that fire up. Well if we exclude the obvious part of being able to try amazing wines, it is the connection you build with the guests. This connection allows me to share the stories that the wine tells as well as my passion for wine. The biggest misconception about sommeliers is that the only thing we do is come to work, taste wines, and leave. For me the sommelier profession doesn’t start or finish as a normal working day; it is a continuous effort to learn more about wine. This whole process is never ending which is one of the charms about the sommelier profession; there is always more to learn. Well except from a proper chilled pint I would say a light and high acid white like Chablis, Champagne, Riesling from Austria or Germany. To start with I’m one of the clumsiest people I know so I have my fair share of these moments. One of the most genuine embarrassing moments for me was when I worked in a relatively high-end place and one lady dropped her phone on the floor and I bent down to get it and my pants ripped open. The sound echoed through the whole dining room and the table behind me had the best seats, full view. At that moment we all just laughed and it was later on always referred back to when the guest came back. I would say travel more to wine regions and study more. The experience and knowledge gained when traveling is so important when learning about wine. Regarding study as we mentioned earlier there is always something new to learn. One of my earliest eye opening moments in wine was when I got to try Les Combottes from Domaine Leroy. Can’t remember the vintage but it was back in 2006 or so. At that time I had never tried such an expressive wine. I still have the label somewhere in my home. We were sitting in the wine cellar of this small hotel on the west coast of Sweden, beautiful place. After working at Hide now since opening I have had to change my answer to this question couple of times. The most recent one that I really remember is when we sold a bottle of Gentaz-Dervieux 1989. I’m a huge Rhône wine geek so tasting this wine was incredible. It’s a wine that I have had on my bucket list for so long. Just spectacular. The guest who has decided that they will be unhappy with the whole experience we offer even before they have started eating or drinking. This type of guest drains so much energy and time from you. This energy could be used to make the experience even better for those who are grateful and enjoying themselves. I really get inspired when listening to chef Ollie Dabbous when he talks about food and his philosophy. Other chefs that really inspire me are Grant Achatz, René Redzepi, Daniel Humm, Dan Barber. A bucket of fried chicken and orange wine. Otherwise anything paired with Raveneau or Salon. Northern Rhône somewhere. I love Syrah, so there is no better place to be. Well winemaking is something that I have always been interested in. Not really an original idea but winemakers seem to have a sweet life. I would like to do this because its incorporates my love for wine, travel and meeting new people. I don’t mind the manual labour. I have worked in wineries before so it would be like putting on a pair of comfortable shoes. Dolcetto. It is a grape that I have and will always struggle with. I have tried one aged Dolcetto that I really liked. I would characterise myself as opened minded so there are few styles or grapes that I dislike. Hugh Jackman is the most memorable customer I have served. He was very polite and kind. I really respect that in a person with such a fame. A true gentlemen. The fact that I can work with such an amazing and knowledgeable team. Well that’s a long list but couple of them are Raymond Trollat from St Joseph, Krug Clos de Mesnil 1979, all the first growths of Bordeaux pre-phylloxera and 1905 Salon.